The Purple Pinkie Nail Salon: Do you really have gel nails? Do you really have gel nails? We have been getting a lot of people asking if we fill gel nails. After some questions, it is determined that these people DO NOT have gel nails, they have acrylic nails with a gel top coat. These salons are purposely misleading the client and charging them more for a service they are not getting. If you truly have gel nails, you will know. Gel is in a pot and looks like really thick hair gel. It is clear, translucent pink or white and you don't mix anything. Your technician will put a layer of gel on and you will have to put your hand into a ultra violet light. She will apply two to three layers of the gel, placing your hand into the light between layers. If your technician takes a brush and puts it into a liquid and then into a powder, this is not gel. This is liquid and powder acrylic. Most technicians will finish pink and white or pink and glitter tip acrylic nails with a gel top coat. This top coat will stay shiny until it is filed off. 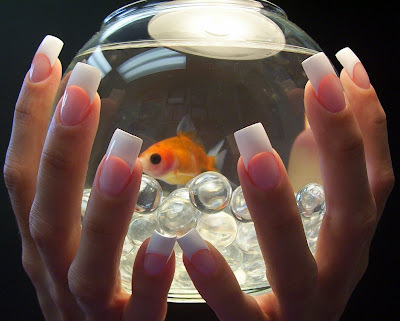 Applying a gel top coat to a set of nails does not make it a set of gel nails. Just recently had this happen to me, pisses me off that I paid extra for the same thing i usually get. Oh and on top of that the hussy hurt my fingers and made me bleed!